Obesity is a problem that can cause psychological discomfort and impaired quality of life, but it also greatly affects your health. Many health care professionals site obesity as one of the biggest risk factors for causing many diseases. Surgical obesity treatment is the only option which offers a reasonable (40-60%) and long-term (lasting more than ten years) reduction in the weight of very obese patients. 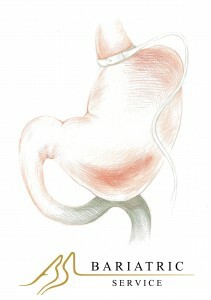 During the course of this procedure, a small pouch is created by dividing the top of the stomach from the rest of the stomach. 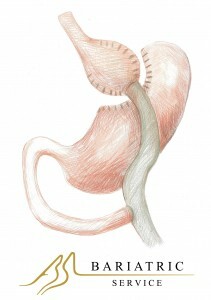 Then, the first loop of the small intestine is divided, and the bottom end of the divided small intestine is brought up and connected to the stomach pouch. The top portion of the divided small intestine is connected to the small intestine further down. The new pouch is a small reservoir for food, which fills up quickly leading to the sense of feeling full faster, therefore you will eat less. Moreover, food bypasses the biggest part of the stomach and the first loop of small intestine. A relatively shortened length of the intestine leads to decreased absorption. Weight loss after this procedure is faster in comparison to the effect after other types of operations. In order to achieve the best possible result, the procedure needs to be accompanied by the balancing of the post-operative diet. The estimated effect reaches up to 60%-70% excess weight loss in 1-2 years after the procedure. During the course of this procedure, the surgeon forms a tube from your stomach. The capacity of this tube is significantly lower than of the stomach prior to the procedure. This leads to less consumption of the food and faster sense of fullness. The food is not deviated from its usual course in your digestive system. If the operation is followed by balanced diet, the estimated weight loss after 1,5 – 2 years is 50-60%. Self-control is a crucial success factor in this process. 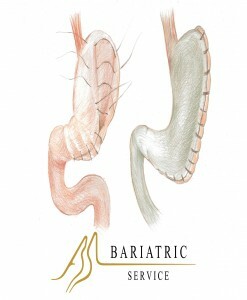 This is one of the most innovative procedures in bariatric surgery. During the course of this procedure, the tube is formed from the tissue of your stomach without the removal a part of the original stomach (which is performed in the previously described sleeve gastrectomy). This method has a lower risk for post-operative complications. If the operation is followed by balanced diet, the estimated weight loss after 1,5 – 2 years is 50%, however, the process is slower than after the bypass or sleeve procedure. The adjustable gastric band acts as a belt for your stomach. It divides your stomach into a smaller and bigger compartment. The upper compartment is smaller and therefore can contain only a little amount of the food, which is consumed. As a result, the sense of fullness is felt faster and the food intake decreases. 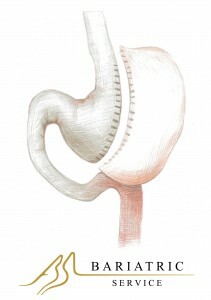 The adjustable gastric band is a silicone ring, which is placed around the stomach. It is connected with a capsule beneath the skin via a small tube. This construction allows the adjustment of the tension within the band, which consequently leads to the desired rate of weight loss. This operation is least disrupting for the body and fastest to perform. In order to achieve best possible results, the band needs to be adjusted several times after the operation. The adjustment is a simple short procedure that can be performed by the surgeon in day-care units. Those who have a BMI of between 35 and 40 and also have a medical condition, such as type-2 diabetes, high blood pressure, arterial hypertension, heart diseases, dyslipidemia, sleep apnea or osteoarthritis that might improve if you lose weight. If your weight and circumstances fit the criteria for weight loss surgery, fill the request form, please. Our team will contact you to evaluate your case. You will have an appointment to see the consultant surgeon in London or on Skype before you travel for treatment. This is done to save you more than one trip to Lithuania for the surgery. First Day – Arrival, consultation and tests. Stay at a hotel. Second, Third Day – Bariatric procedure. Stay in the hospital. Fourth, Fifth Day – Recovery, additional appointment with dietitian and surgeon. Stay at a hotel. Sixth Day – flight back home. You could, of course, arrive earlier or stay longer if you wish to take a little more time. You will have a free of charge postoperative follow- up. We routinely suggest follow- up appointments with consultant surgeon in London or via Skype 1, 6 and 12 months after surgery as well as regular postoperative dietitian support via Skype up to 2 years. The surgery helps you make an important start, and the rest part of success is up to you. In order to be successful, you must make major, long-term changes to your lifestyle and eating habits. It is important to remember that each person will have an individual experience. Your chances to achieve a great success are significantly enhanced if you commit to the treatment, the postoperative follow-up and your diet.